I am artsy/crafty. To the extreme. I draw, I paint, I sculpt. I am a decent photographer since the days you still had to work in a darkroom, not Photoshop. Knit, crochet, sew – even designing and making my own patterns. Every type of needlework. Rug hooking. I design and make jewelry. I make tiny polymer clay dolls that fit in the palm of your hand and toddler size porcelain dolls. Walk me through a craft store and you would be hard pressed to find one I don’t love. But there is one. For whatever reason, I never took to scrapbooking. Not sure why. Tried it. It just never took for me. 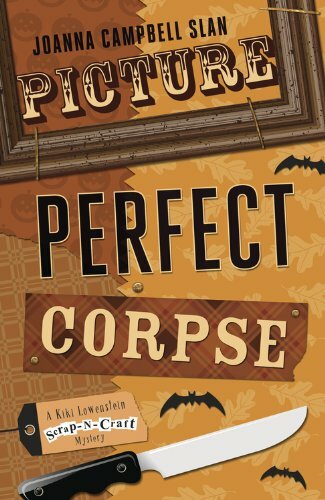 Yet one of my favorite cozy series is the Kiki Lowenstein Scrap-n-Craft Mysteries. Which shows it is about the writing, the characters, the mystery. If you haven’t tried this wonderful series, now is the time to do it. You will love Kiki and how she grows and evolves through the series and how she’s not afraid to tackle social issues. ♥♥♥♥♥ for the entire series. Joanna Campbell Slan will be here on the blog on September 30th so be sure to stop by then. RT Book Review has said that Kiki Lowenstein is that she is “our best friend, our next-door neighbor and ourselves with just a touch of the outrageous.” Once you’ve met Joanna, you can guess where the outrageous comes from. 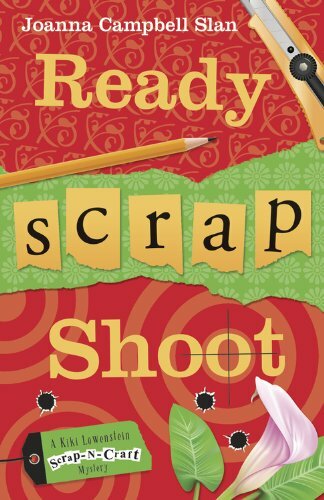 Ready, Scrap, Shoot, the fifth book in the Kiki Lowenstein series, has just been released along with short stories featuring Kiki. A sixth book in that popular series has been scheduled. In addition, Joanna is writing a new historical mystery series featuring Jane Eyre as an amateur sleuth. Death of a Schoolgirl (August 2012/ Berkley) marks the first entry in The Jane Eyre Chronicles. In her ongoing quest to never see snow again, Joanna lives with her two dogs and her husband on a nearly deserted island–Jupiter Island, Florida. Every scrapbook tells a story. Memories of friends, family . . .
Mousy housewife Kiki Lowenstein has two great loves: scrapbooking and her young daughter, Anya. But her happy family album is ruined when her husband, George, is found naked and dead in a hotel room. As Kiki tracks down George’s murderer, she discovers his sordid secret life. Cruel taunts by George’s former flame compel Kiki to spout an unwise threat. 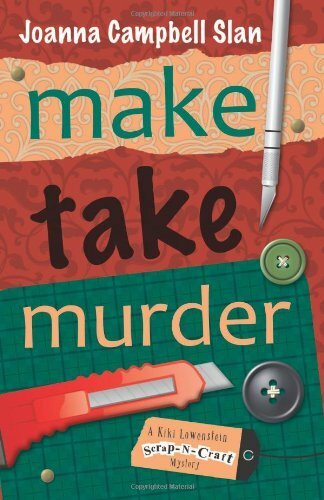 When the woman is murdered, Kiki’s scissor-sharp words make her the prime suspect. She could be creating scrapbook keepsakes for the rest of her life-behind bars. Supported by her loyal friends, along with a little help (and a lot of stomach flutters) from the dashing Detective Detweiler, can Kiki cut the true killer out of the picture and design a new life for herself and Anya? All it took was one scone. 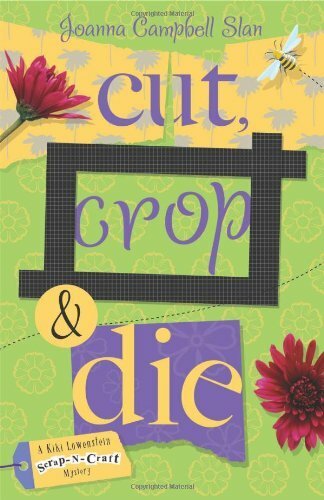 When the hot-tempered (and widely hated) hobbyist Yvonne Gaynor eats a tainted pastry at Kiki’s scrapbooking crop party, it triggers an allergy that leads to Yvonne’s death. Even worse, the police suspect foul play when they realize that someone tampered with the treats and swiped the victim’s allergy medication. An expert at stealing design ideas, Yvonne had enough enemies to fill a memory album. 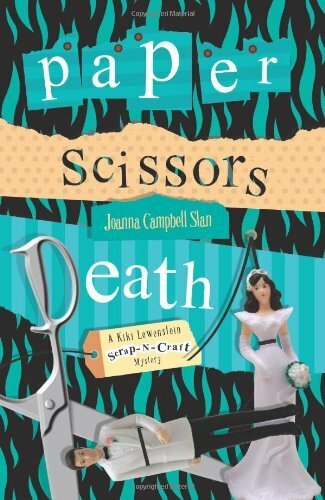 Soon, the scrapbooking community pins her murder on Kiki’s friends and our ace scrapper finds herself dealing with anti-Semitic threats at the shop, a quarrelsome pre-teen daughter at home, a meddlesome mother-in-law, and constant financial pressure. Despite help from the handsome yet annoyingly coy Detective Detweiler, Kiki has her work cut out for her in solving the crime. Old money and tradition are the hallmarks of the St. Louis prep school that Kiki Lowenstein’s daughter Anya attends. But the elite academy is stamped with scandal when Anya finds the dead body of teacher Sissy Gilchrist in its elegant theatre. Even worse, Anya might have seen the killer. Pegged as a shameless flirt and a lousy teacher, Sissy would’ve made everyone’s “least popular” scrapbook page. Especially for those who were seeing red over Sissy’s mixed-race romance with a colleague. Fearing her daughter is in danger, Kiki sifts through the school community’s many shocking secrets to pin down the murderer, while doing all she can to avoid starring in her own memorial album. Dumpster diving for her lost paycheck is definitely the low point of Kiki Lowenstein’s day—that is, until she finds a severed leg thrown in with the trash. Who’d toss a body part in the garbage outside the scrapbook crafts store where Kiki works? Accompanying the grisly “gift” is a creepy computerized voice message, a warning to the store’s “rich and snotty” female shoppers. Kiki soon discovers that the leg belonged to Cindy Gambrowski, a customer with a tyrannical and violent husband—who’s now harassing Kiki. Combing through Cindy’s scrapbook projects for hidden clues, Kiki tries to find the killer. Was it a crime of marital malice, or did someone else beat Cindy’s husband to the punch? Includes holiday-themed projects and recipes! 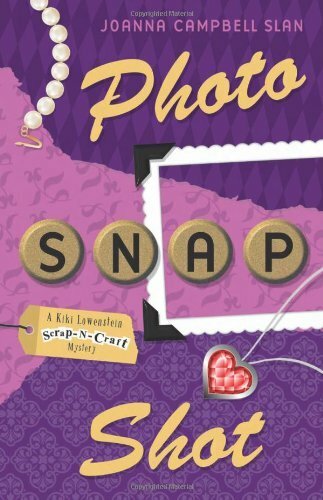 With bills piling up and a brassy new partner at her scrapbooking shop, the last thing Kiki Lowenstein needs is a surprise visit from her browbeating mother. But when shots fired into the crowd narrowly miss Kiki at her daughter’s May Day pageant, it’s another mother—St. Louis’s wealthiest matriarch—who winds up dead. This entry was posted on September 12, 2013, in Book Reviews. Bookmark the permalink.